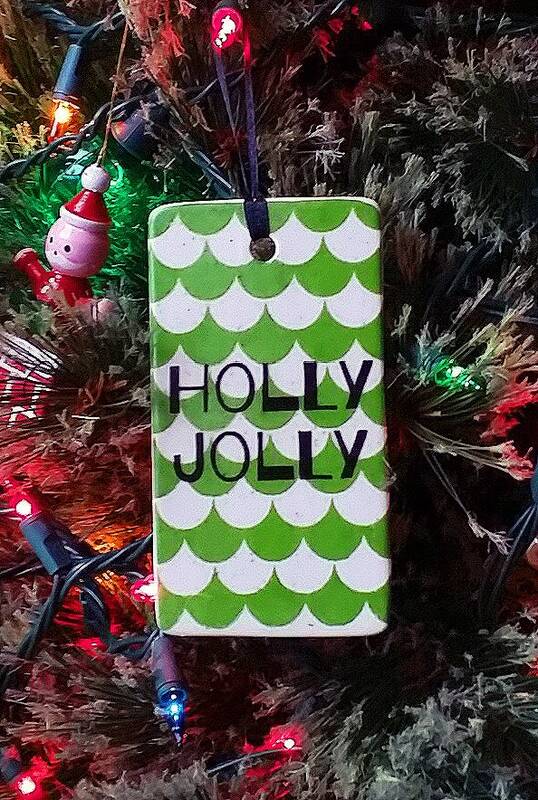 These ornaments are glazed with our new Handmade Paper Glaze - Speckled like handmade paper, it has a warm white softness and lovely speckles throughout. The prints truly pop with vibrancy on this glaze - Bright and festive! 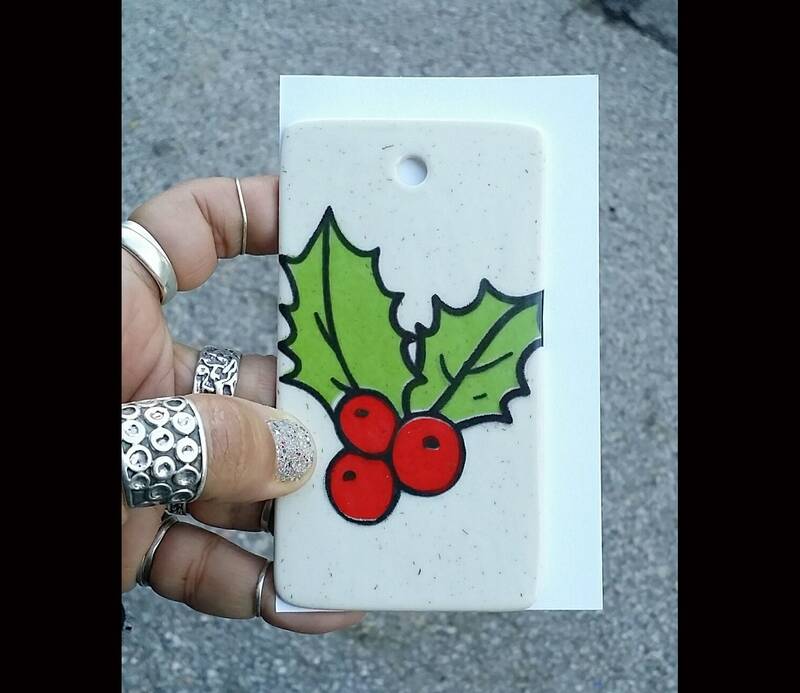 2 1/2 inches WIDE by 4 1/2" TALL, weighs SUPER LIGHT, at 2 ounces! The second image of me holding the ornament has a 3x5 index card behind it, for scale. Packaged in a cloth baggie! 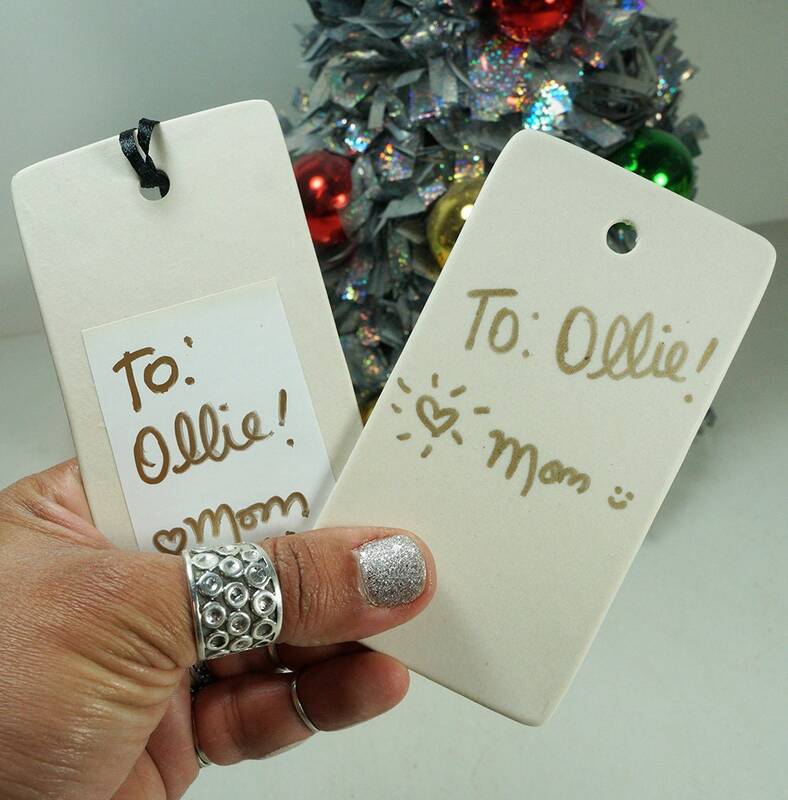 ► If using as a gift tag, you CAN use a Sharpie or other type of marker (test in a corner to see if it stays) - Sharpie is pretty long-term, so if you want to not see it use a sticker/label to adhere to the back. The slight texture from the clay will not prevent a sticker from sticking. 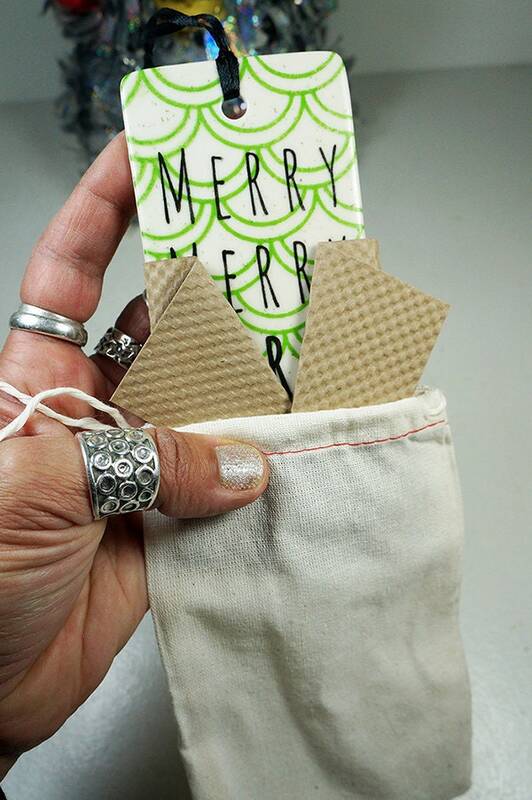 ♥ If it's a gift and it's being shipped directly to the receiver, let us know & we can enclose a note card with a short message from you! The ware we make is very durable! It's food, dishwasher & microwave safe. It's even safe if placed in an oven for warming, from cold to 350. Our prints are indelible, meaning they will not scratch or rub or fade off. We WANT you to use our ware every day, so we make them durable and great looking for every day. We DO NOT gift wrap. All of our packaging is chosen with the need to get the ware to the buyer intact. With that in mind, we do use biodegradable packing peanuts, and when possible, we use rubber bands to secure the bubblewrap so it can be reused. Our "Thank You" cards are recyclable. That covers it, but if you have any questions, do ask! You can send us a convo here about wholesale with your store info! We have a linesheet here on Etsy we can send you to, or a PDF we can email you if you give us your details. All of our listings have a capacity measurement, physical dimensions and weight of the item empty. If you still can't understand the measurement or need more details you haven't seen in the listing, let us know. Custom inquiries are welcome, but please be aware that we charge for design work, including font searches. It's better for you to have you files ready for us to have a look and determine if we can work with them or not, and please be ready to adjust where we feel there needs to be adjustments, in order to provide the best possible results. Please contact us prior to purchasing an item that you'd like personalized, or made custom by adding extra things to it! We can then add the extra cost to it so you know what the final price will be for you. We DO NOT add names, dates, etc to ware without payment for these extra things. Questions? Send us a convo!